Ok, it’s not as scary as it sounds. You won’t find me out shopping in my birthday suit but, after a good rummage through my wardrobe, there are certain items of clothing that I will shortly be saying a fond goodbye to. I’ve never been known for my fashion sense but I do have lots of clothes that I love. 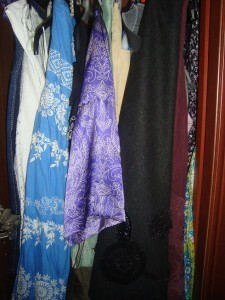 I also have many clothes that are years and years old! In fact, I’m pretty sure some of my clothing is so old that it will be back in fashion very shortly. There is actually a very good reason that I’m pleased to be giving my wardrobe a spring clean and that is because I’ve lost weight. Yes, since January I have been working very hard at shifting the excess pounds (or stones!) that I have been carrying for 7 or more years and I have lost 1 and a half stone so far! Several items of clothing are now too big for me. I cannot describe how amazing this feels! The second good reason that I’m pleased to be having a sort out is that these clothes, many of which are still in great condition, are going to help a very good cause. I will be taking them down to my local TK Maxx this month to support their Give up Clothes for Good campaign. All the items donated through this campaign will be tagged, sorted and sold through Cancer Research UK stores and all the money raised will be used in the fight against kids’ cancer. The campaign is now in its 5th year and, I’m sure you’ll agree, is raising money for a very worthwhile cause. 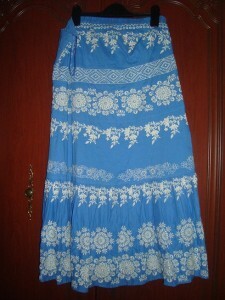 One item that will definitely be heading off to help this great cause is a blue strapless dress I bought from Monsoon. I have only worn it a couple of times – both to weddings, but it just doesn’t suit me! The fact it is strapless makes my arms look like tree trunks and the colour really doesn’t do anything for me. It is in great condition still and is wasted just hanging in my wardrobe. I hope someone will get better use out of it than I do. Along with this dress I will be donating a couple of skirts that are also in great condition but are far too dressy for me now I mostly work from home, some tops that make me look a bit like a granny and a pair of trousers that are unflattering on me but are bound to look great on someone else. Spring is the perfect time to have a good clear out so if you have anything that still has plenty of life left in it but isn’t any use to you any more then please think about supporting this campaign. You can read more about it on the Tots100 blog, where there will soon be a carnival highlighting all the other clothes that bloggers will be giving up for good.